Plants rhizomatous, rhizomes short, stout, scaly. 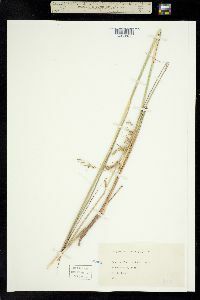 Culms 50-240 cm tall, 1.5-4.5 mm thick, erect; internodes glabrous. Sheaths glabrous or sparsely hispid; ligules 2-6 mm, usually with thick, pointed auricles; blades 10-70 cm long, 1-4 mm wide, usually glabrous. Panicles 20-75 cm, loosely contracted, yellowish to brownish; branches often flexible. 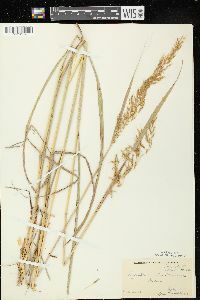 Spikelets 5-8.7 mm. Calluses blunt, villous; lower glumes 5-8 mm, pubescent, 7-9-veined; upper glumes 5-8 mm, 5-veined; awns 10-22(30) mm, about 2-3 times longer than the spikelets, once-geniculate; anthers (2)3-5 mm. Caryopses 2-3 mm. Pedicels 3-6 mm, flexible. 2n = 20, 40, 80. 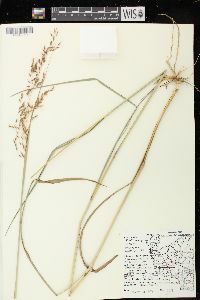 Sorghastrum nutans grows in a wide range of habitats, from prairies to woodlands, savannahs, and scrubland vegetation. 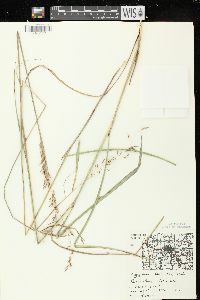 It is native from Canada to Mexico, and was one of the four principal grasses of the tallgrass prairie that occupied the central United States prior to agricultural development of the region. It is frequently used for forage, for erosion control on slopes and along highways, and in restoration work. It is an attractive plant and can be used to advantage in flower arrangements. It grows readily from seed if adequate moisture is available. There are several cultivars on the market. Perennial herb, bearing stout and scaly rhizomes 0.5 - 3.15 m tall Leaves: with hairless or sparsely stiff-haired sheaths, 2 - 6 mm long and membranous ligules, and usually hairless blades 10 cm - 0.7 m long and 1 - 4 mm wide. Inflorescence: branched (panicle), yellowish to brownish, 20 cm - 0.75 m tall, the branches usually flexible. Fruit: a caryopsis 2 - 3 mm long. 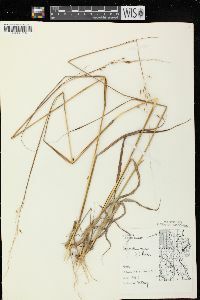 Culm: erect, unbranched, 0.5 - 2.4 m long, 1.5 - 4.5 mm across, with hairy nodes and hairless internodes. 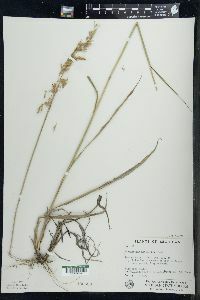 Spikelets: usually stalkless, 5 - 8.7 mm long. 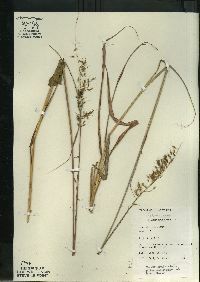 Glumes: leather-like, 5 - 8 mm long, the hairy lower glume with seven to nine veins, the upper glume with five veins. 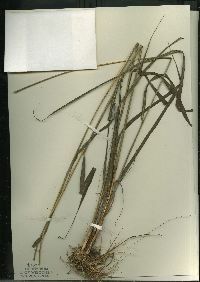 Florets: having a lemma with a bent awn 1 - 3 cm long and anthers 2 - 5 mm long. Habitat and ecology: Common in prairies, this species also grows in sandy soils of open black oak savannas. 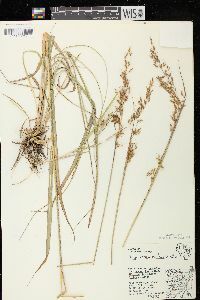 Etymology: Sorghastrum means "a poor imitation of Sorghum." Nutans means nodding. This is essentially a prairie grass and is found in "oak openings" which are remnants of prairies. It is frequent throughout the state where prairie habitats occur and is rare or absent elsewhere. 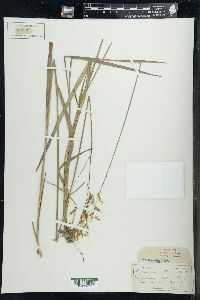 It is sometimes found in marshy places and its most common associate is Andropogon furcatus. 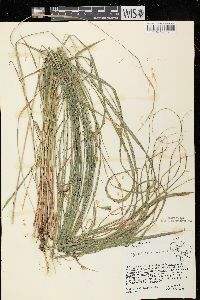 Culms 1-2.5 m, in loose tufts from short rhizomes, smooth except the sericeous nodes; sheaths glabrous to hirsute; ligule well developed, firm, continuous with the auricles; blades 5-10 mm wide; panicle 1-3 dm, narrow, freely branched, golden, the nodes and smaller branches ±villous; spikelets lanceolate, 6-8 mm, the first glume pale brown, villous; awn 9-15 mm, twisted below, bent at about a third of its length; sterile pedicels densely villous, 4-5.5 mm; 2n=20, 40, 80. 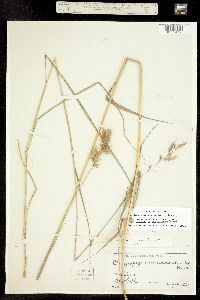 Moist or dry prairies, open woods, and fields; throughout our range, s. to the Gulf, w. to Utah and Ariz. (S. avenaceum) An important constituent of the tall-grass prairies.